Paint-based paw prints allow your dog the opportunity to participate in your art or craft projects. Use only non-toxic paints that wash away easily to protect your dog and your floors after the painting project is complete. Ideally, work with pets and paints outdoors; this way, even if your favorite furry friends run around with paint on their paws, the paint stays outside, and your home remains paw-print free. Before applying paint to your pet's paws, check those paw pads to ensure they're clean. Wipe off paws with damp paper towels, or dip them in warm, soapy water and wipe them off with a soft cloth afterwards. Wipes designed specifically for dog paws offer a quick way to clean those paw pads if the paws aren't very dirty. Washable body paints or fingerpaints designed for young children work equally well for pet paw prints. Since the paints are designed for children to use directly on their skin, the paints are non-toxic. Squirt a little of the desired color onto a disposable plate; then brush the paint onto clean paw pads with a foam brush or paintbrush. Press the painted paw onto the project surface; then rinse the paw off immediately with a hose or in a warm tub of water. Non-toxic tempera paints may be used safely for paw-print projects. Mix powdered tempera paints with water, according to package directions, in a shallow container wide enough in which to place the dog's paw. Alternatively, mix the paint colors first; then pour some of each color onto its own paper plate. Press a clean paw into the paint and then onto the project paper or canvas. Wipe paint off the paw with damp paper towels right away, wiping the fur off as well. If necessary, dip the paws in a small tray of water to help remove paint. 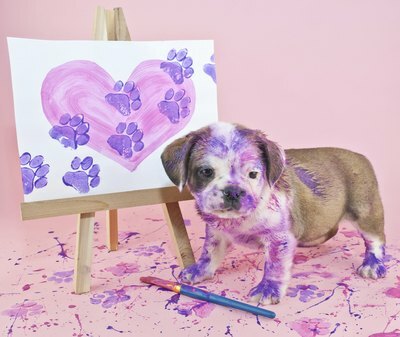 Water-based paints such as non-toxic watercolors designed for children or non-toxic acrylic craft paints provide an inexpensive mean of capturing your dog's paw prints. Watercolors make thin, translucent prints, while acrylic paints create deep opaque prints. If using watercolors, wet the chosen color with water; then brush it onto the paw pads. Press the paw immediately on paper, or the paint may run off or evaporate. If using acrylics, brush on a layer thick enough to capture the print; then press the paw onto the project surface. If space allows, create a large acrylic paw-print painting by dipping each paw into paint. Allow the dog to run across a large sheet of paper such as a roll of butcher paper unrolled across the yard. Wash the paws off within a few minutes before the paint dries.